If you love reading, you don’t want to stop just because the sun has gone down. A reading light can be a great addition to the arsenal of every dedicated reader, as it is a very portable, straightforward device that has a warm light glow. By employing LEDs, these reading lights can deliver a superb reading experience for a prolonged period. What’s more is that very little of the light escapes into your surroundings, making them perfect for reading in bed without disturbing your partner. With such a lot of benefits, we’re going to look at one of the most trending models on the market right now. This is a reading light that contains four built-in LEDs to produce the right amount of light. A rechargeable lithium battery is used to deliver between six to 12 hours of light depending on the light level selected. It should be noted that this is a reading light designed to be mounted directly to the book itself. To that end, it is a pretty small model, measuring less than five inches in length and weighing less than 1.5 ounces. As one of the smaller LED book lights on the market right now, this model is designed for people who have limited reading areas. At well under two ounces in total weight, you can clip this model to your latest book, turn it on, and forget it’s there. Of course, the very useful light it will cast will be noticeable. It should also be noted that with just four LEDs, this product is going to create a bit less total light power than many contemporary models that boast six or even 12 LEDs. For that reason, it could be particularly well suited to those who read in a shared space. For example, if you read in bed, there will be little light escaping to bother your partner. Inside the package, you will find one LED light with the dimensions and weight we discussed above. In addition, you will also receive a handy user guide and one USB charging cable. Of all the impressive design features that truly stand out on this product, one is the four LED bulbs that provide an excellent compromise between light power projection and minimal light spill over. It is also particularly impressive to see a color temperature of 2700 to 5000 Kelvins, which means this product has the capacity to deliver a range of light levels. We were also impressed with the lithium battery integrated into this unit. It’s because the manufacturer has gone with a rechargeable battery of such a high-grade material that the overall weight is kept down. Even with the smaller size, the lithium battery can still deliver excellent power levels for decent run times. Another thing that really impressed us is the size of the unit. The fact that TopElek have managed to squeeze all of these useful features into such a small light is a testament to superb designing, and you will frankly struggle to find a reading light that packs so much into a body of such a low weight and size. This is a remarkably simple product to use. Simply attach it to your book with the easy-to-use base clamp, turn it on, and select the appropriate light level, and away you go! Always remember that this is a rechargeable light, so there are no internal batteries to remove and replace with a fresh set if the power level drops. It’s a good idea to regularly charge the device, so you always know it has plenty of stored power to fuel a reading session. All in all, this is a very nice reading light from the more compact end of the size scale. While that has its advantages in terms of comfort during use, it also has a few disadvantages. Primarily, the smaller battery is not going to be able to produce the longer runtimes of larger models, and it also stands to reason that four LEDs are not going to generate quite the same light level as models with more LED bulbs. That is why we’ve picked the Raniaco LED Clip Reading Light as our alternative. It is of the same high-quality build as this model from TopElek but boasts no less than 12 built-in LEDs. If it’s more raw power you are looking for in your reading light, this could be a reliable alternative. 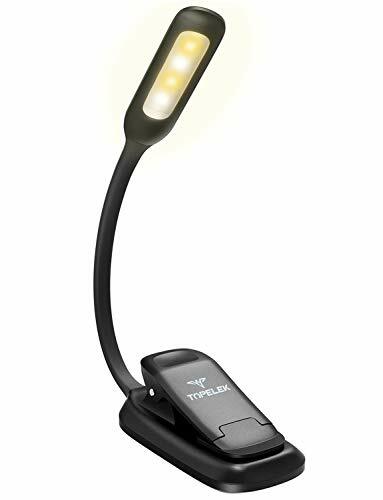 The TopElek LED Reading Light is a very well-designed light that is extremely small and compact, making your reading experience more comfortable as well as convenient, especially if you don’t have a designated reading area. You simply won’t find a lighter rechargeable reading light, but it does mean a reduction in overall power. Whether that tradeoff is worthwhile or not will, of course, be a decision you need to make, and if you do decide to go for this product, you can rest assured you have selected a very high-quality, practival, and portable reading light.